DC Home and Condo Prices: CityVista: Rent or Buy? Why would rents increase by 3% if house prices are declining by 1%? I have nothing to offer other than I took the default value. Considering the price reductions at "The K", the tax advantages (including the possible new 15,000 non-repayable tax credit in the stimulus bill) and the potential to lock in a very low mortgage rate in the next month I'm all for purchasing. Run the numbers first before you whip out that check book and remove $40K+ in cash from your bank account. Once liquidity is gone, it's gone. And get your facts straight on the $15K tax deduction before you leap. If it's like the $7500 deduction currently in place, it'll be means tested so you may not qualify and it's a one time benefit. So that's great for year 1 of the mortgage, but don't forget about years 2-30. I suppose you can keep the 43,000 in a bank at zero nominal interest rate and thus a negative real return. It is in no way obvious that purchasing a home with a five- to ten-year horizon is not the best investment option going presently. Not sure what opportunity costs you have in mind therefore--maybe liquidity preference? Hi. Ignorant person with an ignorant question here; so, sorry to slow down the pace of this comment thread. As a first time homebuyer in the district, do you have to claim the DC tax credit, or can you claim the 7500 dollar credit (ignoring the 15,000 dollar potential credit, for now)? I think City Vista rentals rates will jump by far more than 3% once the building sells out. The low rates are just to move massive amounts of inventory. If they priced all their inventory at market rate it would move much slower. Their pricing low and then once the building is full they will likely raise rents by 5-8% a year until the rents catch up with Penn Quarter rents. At that point when equilibrium with market rate is reached then rental increases will be less aggressive. I've lived through this is Ballston. It was very typical for property mgmt to raise rents on a $1200 unit by $100. They assume that the law of interia will kick in with a substantial % of their renters. Many people don't want to go through all the hassle of moving to save $100 a month. In fact, moving itself will cost a minimum of $300 in logistics such as moving trucks, installation fees you will incur at your new residence, etc.. The NY Times model uses annual rent increases in the market place, not a specific building. Despite the developers' fervent wishes, CityVista is not a market place unto itself. They're competing with landlords throughout the District. Increasing rents would mean that the rental housing market is getting tight throughout the market. I experienced that first hand in SF during the Internet boom when every dotcom millionaire wannabe moved to the City. However, when the District has a 16 month supply of existing condos for sale, all of which could easily be converted to rental units, I don't see the demand/supply pressures that would justify the rent increases you're projecting. Moreover, the economy is such today that I don't think landlords would risk encouraging folks to look for housing alternatives. Debt has to be serviced. I suspect your Ballston experience occurred during a more boisterous housing market and more robust economy. 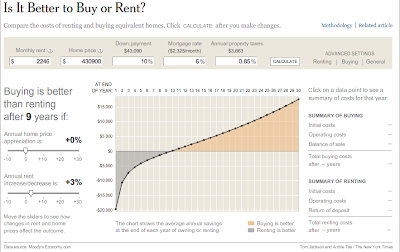 One more thing: the rent increase assumptions on the NY Times tool can be adjusted. I simply took the default. There's another assumption that I don't fully understand - why are we assuming 10% down? FHA financing (or VA if you qualify) means that you only have to put down 3.5% and pay the up front funding fees etc. - which makes it come out to somewhere around 5% for most people. That changes the equation quite a bit I'm sure on the rent vs. own calculator. I think we've reached the analytic point of "it is what it is." Everyone is free to use the NY Times tool to plug in their assumptions. City Vista is not a market place into of itself. But those prices are $300-500 less than the market right now. I'm sure part of that is because those quotes are the "from prices" but it's also because they have an immense amount of inventory to work off. When contracts come up for renewal they will raise rents more aggressively than 3%. Their goal isn't to remain $300-500 below market forever. To think they won't work to close that gap is naive. The NY Times tool's recommended rent growth is good for the typical building that is already priced at market rate. However my experience is that you always feel it is appropriate to apply macro solutions to micro issues and dismiss all context. My Ballston experience in 2001-2002 (pre-real estate bubble) suggests your assumptions are oversimplified. I've also heard David Mayhood confirm that pricing to move then raising aggressively at renewal time is how new apartments merge into a soft marketplace. Heh--You forgot "There's an intangible psychological aspect to renting one's home. It's great to have the freedom to pick up and move every single year, without having to spend months buying and selling real estate. It's even greater to call a landlord when something breaks, rather than waiting hours for the furnace man. Best of all, one doesn't have the stress of owning an asset whose value can drop like a stone, making it practically impossible to move." I used an estimated condo fee in the calculations - the value I used is mentioned in the post. What one forgets is that your 6% mortgage is a fixed rate. Likewise, the time value comes down to about 5 years, but depending on your circumstances, this may be lower (kids, etc.) A landlord won't usually set a 5 or 10 year fixed lease. And consider that your landlord might not respect you and treat you as temporary. Plus, there's nothing like the security of owning part of the American pie. However, we should not take lightly condo fees. When applied, HOA fees are usually much lower. The seemingly low price of a condo could be deceptive- buy a not-condo. City Vista is losing money hand over fist. The developers were in over their heads to begin with and got heavy subsidies from the City. The Condos aren't selling and the two Apartment Buildings on the Site are up for sale. Why woudld anyone is their right mind purchase a unit on a sinking ship? Also, the Condo market is thoroughly saturated and the NorthWest One Project will add another 1000 units within the next three years, including townhomes in NW DC, two blocks from City Vista. This will result in further losses to value for City Vista. Rent if you must. Take the difference you save as a renter ($400 conservatively) and put it in a zero percent savings account, after 10 years, you have $48,000. Not too shabby. call me stupid, but I think buying is still the right thing to do. I wouldn't touch City Vista or other big developments like it with a ten-foot pole, but there are appropriately priced units available around the city, many in smaller developments (i.e., the wilson house on 10th, broadstreet in CH, among many, many others). Those will hold their value much better than CV, etc, and outside of the tax advantages, the District is just not suffering as badly and probably won't. I would treat homeownership as a conservative savings vehicle. If you plan on staying more than five years, you can and will sell for a price that, at the very least, allowed you to live there for the cost of interest+taxes+maintenance, all in all way less than renting. Again, call me stupid, or optimistic, but I would feel OK if I was getting in the market right now. Interesting post, thanks. I've been looking at the Vista complex first as a potential new primary residence and now continue to follow it as an interesting guide to the health of the DC condo market. I held off buying over there because of all the additional product on the market and am now renting on the Hill near Eastern Market and renting out my old condo in Dupont. Was amazed to see how well the prices have held up in 20009 zip code. Am currently saving for the next down payment and able to save hundreds per month by renting. Also looking forward to the tax benefits of being a landlord as well, improvements, condo fees etc. Funny reading this little bit of history! City Vista values (amazingly) haven't dropped, but the condo fees are now almost $600 a month. I bought a 2-bedroom rowhouse 3 blocks away for less than 1/2 what the 2 bedroom condos at CV go for. Ya'll are/were/still are crazy.